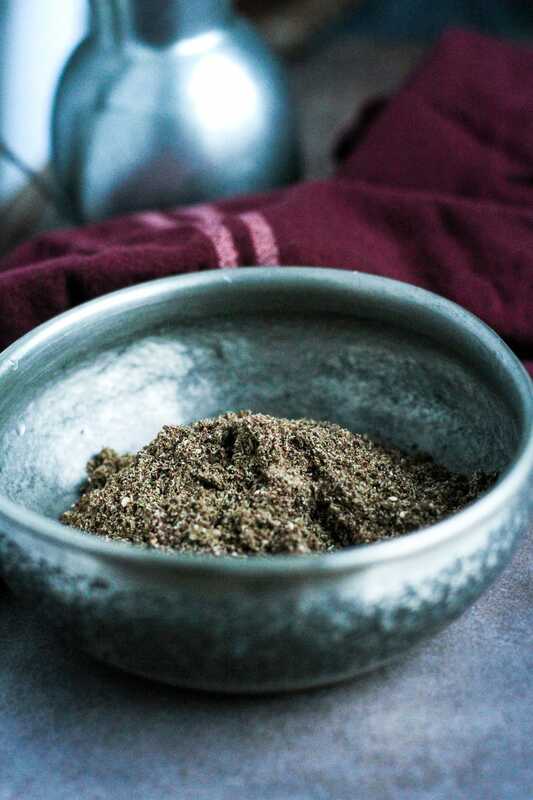 Za’atar is a Middle Eastern spice blend consisting of aromatic and sour sumac, fragrant thyme, sesame seeds, and salt. It’s easy, it’s delicious. I’ll try to keep it short today. 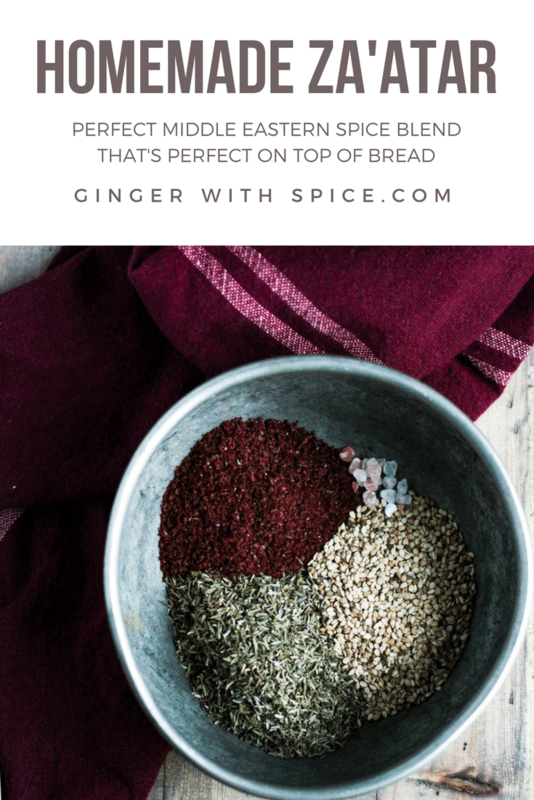 I just wanted to share with you a super easy spice blend that tastes amazing on bread. Because I love bread. So – I didn’t like thyme before. I think the problem was that I tasted it in an omelet when I was a kid, and I like my eggs a certain way, very particular about that. And thyme just did not go with omelettes. Sorry, if that’s your thing. So I just always thought I didn’t like thyme. But I do now, fortunately. I figured I was missing out, I made an Italian seasoning (I’ll make another blog post about it, but you can still find it in this recipe) which also had thyme, and it was so delicious. When I found the za’atar recipe, I thought to myself that this too had to be yummy. Aand I was right! This recipe is adapted from Genius Kitchen. 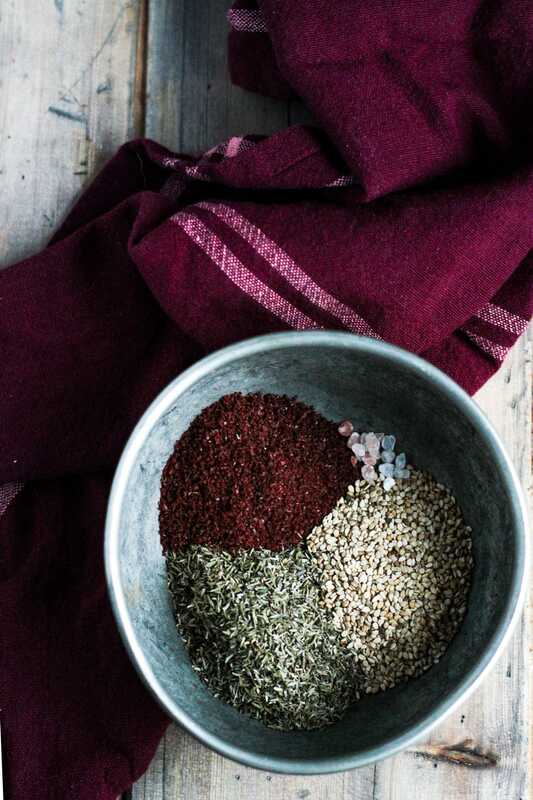 Place all the ingredients – sumac , thyme, sesame seeds, Pink Himalayan Sea Salt – into a spice grinder and grind until powder form. Store in an airtight container. People always give such short ‘expiration date’ on things, and this is no exception. 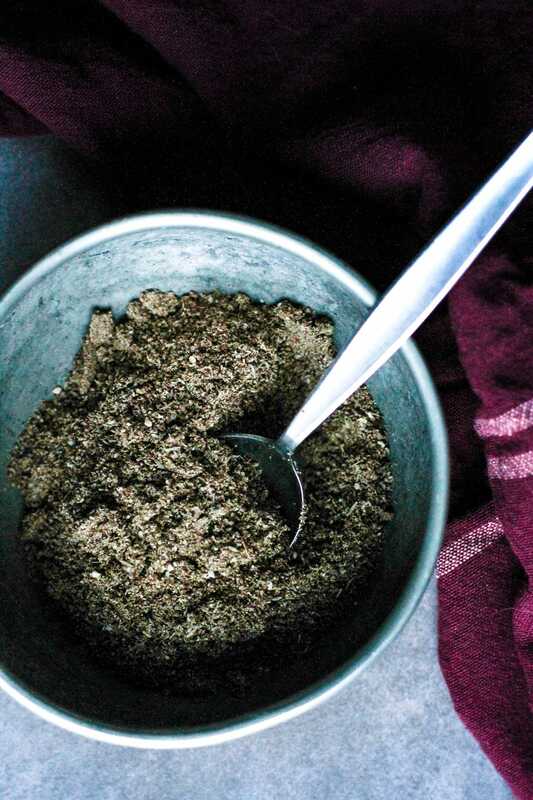 I made za’atar in January and – guess what – still fragrant and yummy. The only thing that can happen is that it will be less fragrant, but it hasn’t been my experience. Don’t throw it away just because it has passed its 2 weeks of life. And if you don’t have a spice grinder (looking at you, sis), place the ingredients in a plastic bag and bang your frustration out on it. It probably won’t be as fine a powder as in a spice grinder, but who cares, it tastes amazing nonetheless. I like to spread it with a tiny bit of olive oil on bread, be it naan, pizza or even croissants! I haven’t tried it on croissants yet, but I saw it in a recipe the other day and I have to say I am intrigued. Recipes where I use za’atar will come up shortly, so just stay tuned for that. Hope you like it and find uses for it! If you have any interesting uses for it, or other feedback, I’d love to hear from you – either in the comment section below, or tag me @thegingerwithspice on Instagram. And don’t forget to Pin it for later! Za'atar is a Middle Eastern spice blend consisting of aromatic and sour sumac, fragrant thyme, sesame seeds, and salt. It's easy, it's delicious. Place all the ingredients - sumac, thyme, sesame seeds, Pink Himalayan Sea Salt - into a spice grinder* and grind until powder form. * And if you don't have a spice grinder , place the ingredients in a plastic bag and bang it with something hard, e.g. a rolling pin. It probably won't be as fine a powder as in a spice grinder, but still very tasty. ** People always give such short 'expiration date' on things, and this is no exception. I made za'atar 4 months ago and - guess what - still fragrant and yummy. The only thing that can happen is that it will be less fragrant, but it hasn't been my experience. Don't throw it away just because it has passed its 2 weeks of life. I love learning about and trying new foods or ways of preparing food. This sounds intriguing. I’ve never tried it, but I’d love to! 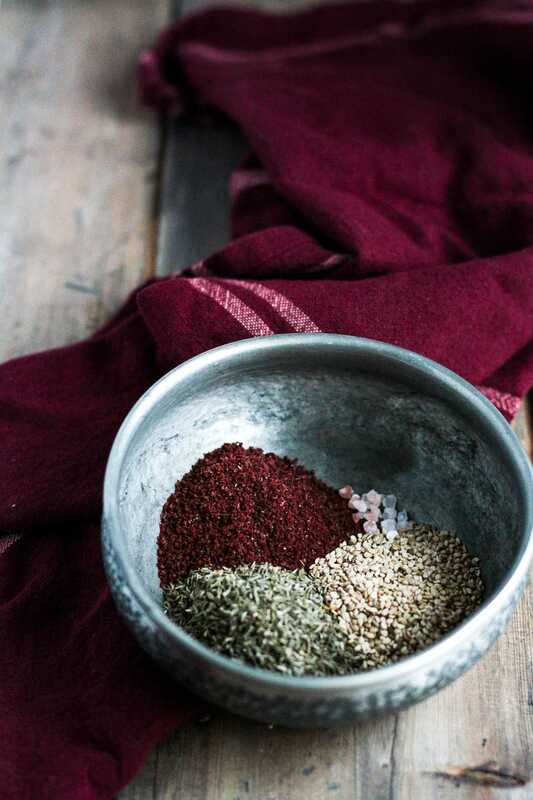 I love Za’atar spice, I cannot wait to make this recipes and use it in a new recipe!! Thank you, Casey! I hope you’ll like it! I love za’atar. We always buy it in Dubai and bring it to Europe. I never though of making one at home from scratch. I am definitely going to try, it doesn’t look too difficult though. I haven’t been anywhere lately where I could get za’atar, so I had to make it myself. But I think it’s delicious, I wonder if it tastes similar to the one you buy in Dubai! 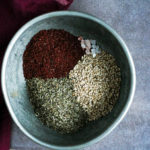 Im lucky to live near a Middle Eastern area where I can get freshly blended Za’atar, Raz el Hanout and others but this is an easy recipe to follow as I know some aren’t so lucky to live near an area like this. I wish that was me! I love Middle Eastern food, but it’s often very difficult to find the ingredients here. I’ve spent months looking for edible rose petals for ras el hanout, and I still haven’t found it (not many ship to Norway, and if they do the customs tend to stop them). Soo I’ll have to look for it when I’m traveling! za’aatar is my favorite!! I just bought some because I made labneh the other day, but once my container is finished I’m going to follow your recipe and make my own blend! This sounds yummy and it’s so easy to make! Your photos are gorgeous as well! 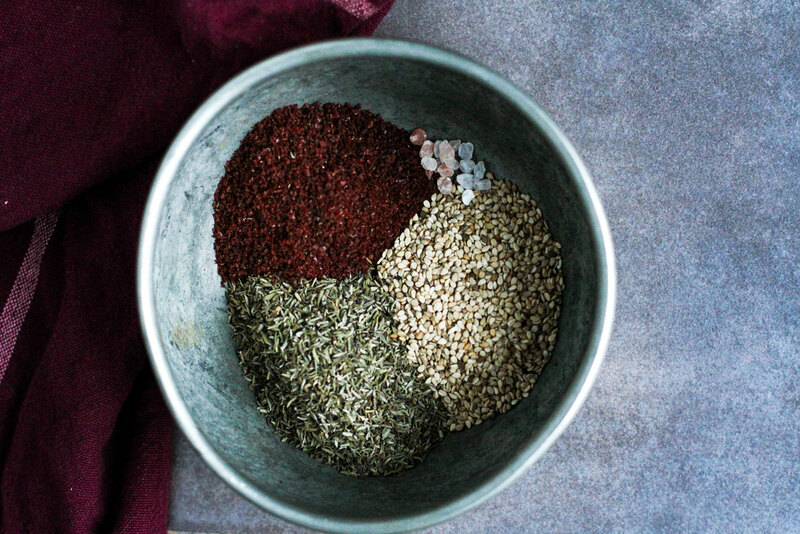 Your pictures are so gorgeous and this spice mix sounds amazing! How wonderful! I love the smell of za-atar and never thought the combination is so simple but flavorful. Thank you! I know right, me neither! So easy, but so tasty too.